Intimate Apparel is directed by Susan Baer-Collins. The director's assistant is Deborah Conley. The show is stage managed by Jeanne Shelton. The Cocoanuts, a musical comedy based on the hilarious antics of the Marx Brothers featuring music by Irving Berlin, will start OCP’s mainstage series September 12 – October 12, 2008. This will be the first performance in OCP’s newly renovated orchestra pit and you won’t want to miss the incredible transformation made possible through generous donations by the Alan and Marcia Baer Foundation and the Douglas County Commissioners. The newly named “Baer Pit” will house Musical Director Jim Boggess and the rest of the talented musicians who will bring the Irving Berlin classics “Shaking the Blues Away,” “Always,” “Blue Skies,” and “How Deep is the Ocean,” among others, to life as part of The Cocoanuts. One of three Broadway hits that made Groucho, Chico and Harpo stars, The Cocoanuts is a hilarious spoof of the Florida land boom of the 1920s. Full of comic dementia and clowning, this is a joyful laugh-fest that does everything musicals are supposed to do. Tickets go on sale to the public on September 2nd. An ideal show to open our 2008-2009 Season, Intimate Apparel shows off the production qualities for which we are known: an incredibly creative set, depth of talent on stage, and beautifully made costumes. 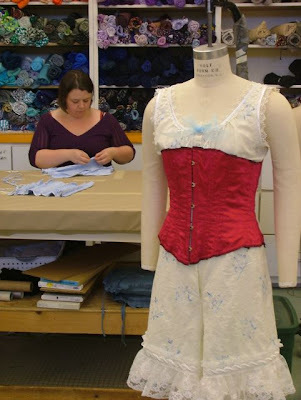 Exquisite silks, laced corsets, and a handmade suit are all pieces of the design puzzle for costume designer, Georgiann Regan. Regan began the costume design process several months ago by reading the script, meeting with the director and researching the fashion silhouettes, fabrications, colors and hair styles of lower Manhattan in 1905. This research inspired Regan to create one significantly bright colored corset amongst a palette of sepia toned costumes. Regan also selected fabric with visual texture to help the audience experience the strong emotions between the lead character, Esther, and the fabric merchant. Intimate Apparel, by Lynn Nottage, is set in 1905’s lower Manhattan. It is the story of Esther, a single, African American woman with a genius for creating exquisite lingerie prized by both wealthy Fifth Avenue women and “ladies of the night.” At 35 years old, Esther wonders if romance will ever come her way. When she begins correspondence with a man from Barbados and he arrives in New York to meet her, there are surprises in store for both of them. Visit our blog to learn about the actors, the rehearsal process and how this show is coming together. Intimate Apparel runs August 22-September 21. Tickets go on sale to season subscribers August 5 and to the general public August 12. Tickets may be purchased by calling the box office at 402-553-0800 or on the web at www.omahaplayhouse.org. Groups of 15 or more receive a discount. Contact the Director of Sales at 402-553-4890 x147 or knewman@omahaplayhouse.com to make group reservations.